The CTL 2goPad SL10 is probably the best Windows 7 tablet I’ve used so far, thanks to its sturdy build quality, attractive design, and responsive capacitive touchscreen display as well as helpful buttons on the side of the case. Unfortunately, it’s still hampered by a slow processor, low resolution display, and the fact that Windows 7 simply wasn’t designed from the ground up for touch input on this type of device. Unlike the iPad, the 2goPad can handle Adobe Flash, as well as Microsoft Silverlight, and virtually any app or technology designed to run on Windows computers — even if those apps weren’t really designed for touch input. And unlike the iPad, the 2goPad has an SD card slot, 2 USB ports, and a camera. If those things matter to you more than a user interface that feels clunky at times, this may be the tablet for you. If there’s one thing I’ve learned from testing the Nav9 and 2goPad in recent weeks, it’s this: Windows 7 may have been designed with touch in mind. After all, there’s handwriting recognition and an on-screen keyboard. There’s support for multitouch gestures. Windows 7, on the other hand, was clearly not designed with devices like these in mind. It simply doesn’t play well with touchscreen devices with low resolution screens, relatively slow processors, and low power integrated graphics chips. Some of those things -- notably the size of the tablet and software -- can be mended, and we're hopeful that future products like the ExoPC, Tega V2 and even the HP Slate will provide better experiences in that regard. On the other hand, battery life is going to be a consistent issue with all of these Atom tablets, at least until Intel is ready to release Oak Trail in early 2011. And, well, that's why we're ultimately starting to feel as if now is not the best time to buy a Windows 7 tablet -- there are better internal organs and software (hopefully!) on the way. But look, if you are in search of a capable slate running Microsoft's OS and must have it right now, we do have to say the $499 SL10 is one of the more decent and affordable choices out there... just keep in mind, that isn't really saying much. The iPad is the 800-pound gorilla when it comes to consumer tablets, but it's not for everyone. Many users want a more productivity-focused slate that runs all their favorite desktop apps. 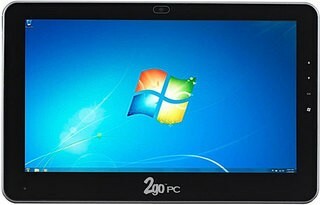 However, most Windows 7-based tablets we've reviewed thus far have suffered from weak performance, poor battery life, hot temperatures, and unresponsive screens. The CTL 2goPad SL10 takes a swing at the champ by including a touch interface that rides on top of Windows and an accelerometer, as well as a webcam and a wider array of ports. Can this slate really compete? Visit the CTL Q&A Forum to get answers, ask a question or help others.